To be eligible for a refund less $50 fee, registration cancellation must be received in writing by October 2, 2019. Questions? Please contact NABE at nabe@nabe.com or phone 202-463-6223.
and scan/email to nabe@nabe.com or fax 202-463-6239. Registration by email/fax includes a $25 processing fee. Save $25 by registering online! 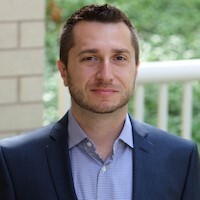 Matthew Harding is an Econometrician and Data Scientist who develops machine learning and artificial intelligence techniques to answer Big Data questions related to individual consumption and investment decisions in areas such as health, energy, and finance. He is an Associate Professor of Economics and Statistics at UC Irvine. He holds a PhD in Economics from MIT and an MPhil in Economics from Oxford University. He directs the Deep Data Lab which conducts research into cutting edge econometric methods for the analysis of “deep data”, large and information-rich data sets derived from many seemingly unrelated sources to provide novel economic insights. At the same time his research emphasizes solutions for achieving triple-win strategies. These are solutions that not only benefit individual consumers, but are profitable for firms, and have a large positive impact on society at large. Professor Harding advised a number of companies and agencies on economics and data science problems, including Apple, US Commodity Futures Commission, World Bank, Electric Power Research Institute (EPRI), and the Department of Justice. He is also an advisor to a number of technology startups.